Complete all of your popular soup offerings with a packet of these Lance oyster crackers on the side! Lance has provided satisfying snacks made with wholesome ingredients for over 100 years, offering classic and innovative snack varieties. For snacks of superior quality and timeless taste, offer Lance crackers at your restaurant, concession stand, extended stay facilities, or event! Excellent portion controlled cracker package. The Lance brand of oyster crackers is our favorite, over the more popular national brand, for a fraction of the price! Great quality oyster crackers that are packaged up for individually serving which makes it easy to include with our oyster and clam chowder. Great fresh style crackers from Lance. This crackers are great- there is enough in a package for 8-12 oz bowl of soup. We got a box that expired about a 4 weeks from when we got them so they must not have much of a shelf life. Lance Oyster Crackers are great in soups and stews. Their unique shape helps them stay crunchy from beginning to end. The portion sized packet is the perfect size serving. They're great in house or for take out orders. These little oyster crackers have a terrific taste. They are great in soups or salads, holding their crunch much longer than other kinds of crackers. The individual portion-control packets are economical and are perfect for in-house or take-out orders. Packaged great for minimal broken crackers. The size is great for a cup of soup and two is great for a bowl. Perfect to throw in a to go bag for carryout. These turned out to be a great find! The size of the package is perfect for a small bowl of soup. The 150/case size make them a good overall value for individually packed items. These small packages are really handy! The crackers go perfectly with soups of any kind. We use them for both carry out and in house dining. People love them- they stretch a bowl of soup out to fill you up more. A great prepackaged bag of oyster crackers from Lance that were great at our luncheon. The crackers made a lovely addition along side our chowder. The Lance Oyster crackers are very tasty and great for our fishing trips. The crackers help settle sea sickness and are also great in our soups. All our patrons love getting a pack or two with their soup. These oyster crackers have an excellent flavor and they super easy to store. Plus they last for a year. We serve this both with our clam chowder & homemade chicken noodle soup. They hold up well, don't get all crushed to bits in the packages, and area reasonable price. Very happy with this purchase. These oyster crackers go great for soups, salads, sandwiches, and chili. We have ordered these multiple times and we have never been disappointed. Thank you! Lance Oyster crackers are a great value with tremendous quality. If you sell soup oyster crackers are a must and Lance Oyster crackers are the answer. A great pack of Lance oyster crackers and at a wonderful price point. These are perfect to include in our to go bags with soups and chili. The Lance Oyster Crackers are really good with soup and chili. I really like the individual packages. Perfect for cold lunches. I would definitely purchase again and recommend. These crackers are great with soups, or for giving as a snack to toddlers. The individual serving packets are so convenient, and parents love that we can offer a little snack to kids. Lance Oyster Crackers go great with all types of soups and salads. I like the individual packets as opposed to bulk packaging. The crackers are fresh and taste great. Kids like them as a snack. Thanks for the great product. Great oyster crackers, i use them in clam chowder and chili. Taste is great compared to store brands, and you get 150 packs that dont go stale! Many I know prefer oyster crackers to saltines in all kinds of soups. These are good crackers. They do not taste stale. They are tasty for crackers. Great oyster crackers for any soups. Fresh and crispy every time and great for little fingers to have as a snack for on the go. Best buy ever for a lobster bake i have coming up !!! SO happy to have them all come in one big box- great price too! These tasty crackers make a perfect addition to any soup or chowder in our cafe. I would high recommend them for the price, individually sealed. Just the right size to serve with our take out soup orders. Lance is a good name and they make a quality product. Long lasting as well. These oyster crackers are a quality option at an excellent price point. The portion is typical of other brands and works well when serving chili or soups. These crackers are popular with our customers. They pair nicely with soup and even as a crunchy salad topping. The individual packaging is convenient and helps maintain freshness. These oyster crackers are my favorite thing to top of clam chowder! If you want a simple way to make soups more elegant, then buy these crackers. A classic pairing with any type of soup, not just chowder. These crackers have just the right crunch and amount of salt. As an added plus, these helped my wife through morning sickness during two pregnancies. We've found these to be tasty and the best product for our money. Customers like them and the staff love the easy of serving them. We'll keep buying these. We need Oyster Crackers for our Clam Chower and Lobster Bisque, Lance Oyster Crackers taste great, really a good buy for us,we will come back buy again! Oyster crackers are pretty much all the same but these are a steal at such a low price for so many packets!! Great for tomato soup, chili and all sorts of soups!! Great for making a crust on tuna!! We just started using the individual wrapped packages and we can say enough about them. The pre-portioned size is just the right amount for our customers. The crackers are not overly salty and have a fresh taste to them. No matter the soup, these oysters are a good addition. I actually stock these to go out with our catering orders and particularly large orders of our signature clam chowder. A solid product. These Lance oyster crackers taste great in our very own new england clam chowder. Buy a case or two and keep them on hand. They have a great shelf life. The lance name sells it. These are great with any soup we serve. 150 to a case is a good buy for the bussiness also. 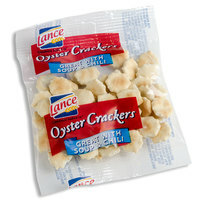 Lance Oyster Crackers are great and of course prepackaged for convenience when serving soup, chili, etc. One thing that I don't like is the fact that I have to use them quickly so they don't "get old" and stale. customers love these and i love the price. they often ask where we get them also!! we serve these with all of our soups and they taste great too!! The Lance Oyster Crackers 150/cs.Are great and not just for oyster stew. We also serve them with our clam chowder .We give a pack to small children when they are fussy waiting for their meal.If it is Lance it is alway's good.